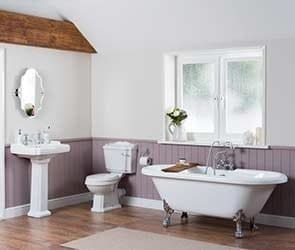 Complete Bathroom Suites from only £199 5% discount? 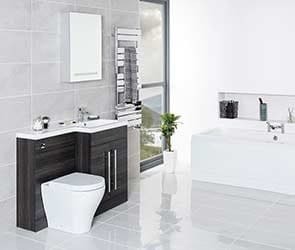 A bathroom suite builds the foundations for your entire bathroom and helps create a unified design. Comprising of at least a toilet and basin unit, they include the main components that you need to create a functional and stylish space. At Bathroom Takeaway, we stock a wide range of affordable designer bathroom suites in a variety of styles to really build the character of your room. ###H2###Complete Bathroom Suites###/H2######BR### Choosing the right bathroom suite can really help to transform your bathroom into a relaxing haven, with minimal effort and without breaking the bank. Whether you prefer a traditional bathroom, with intricate style features, or the angular design and sleek edges of a modern bathroom suite, we have something for everyone, from shower bath suites to freestanding bath suites and cloakroom suites.###BR######BR### Dependent on whether you are redesigning a master bathroom or a cloakroom, Bathroom Takeaway's range includes space saving alternatives, from just a simple toilet and basin unit through to freestanding bathroom suites, which will really help inject a luxurious feel into your bathroom. 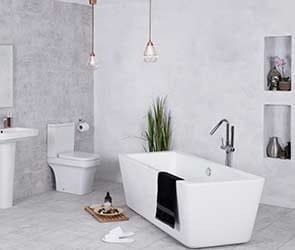 In just a few clicks, you are sure to find a bathroom suite to perfectly match your style and functionality requirements, no matter your budget.###BR######BR### As well as stunning designs, our bathroom suites also come with a 10 year Fit and Forget guarantee, so you can be sure your bathroom suite is stylish, functional and built to last. 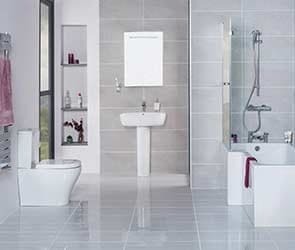 Couple this with our promise of everyday low prices, choosing a bathroom suite from Bathroom Takeaway really is as easy as 1-2-3###BR######BR### ###H3###Choosing the perfect bathroom suite###/H3### Picking a bathroom suite can be a difficult process and there are a few practical considerations that should be taken into account, in order to make it as stress free as possible. 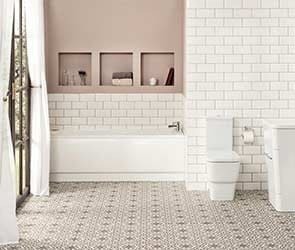 First things first, it is important to know the size and measurements of your bathroom, so you can pick a suite that will comfortably fit in your room. If you are redesigning a cloakroom, you will most likely be looking for a small bathroom suite, such as a toilet and sink set, whereas in a master bathroom, your preferences may change and you may be looking for a larger bathroom suite. 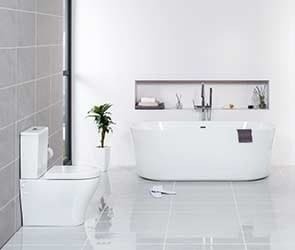 Once you have decided on the size of your bathroom suite you can start to think about the style, functionality and the components.###BR######BR### One of the primary concerns for buyers when looking into purchasing a bathroom suite is usually the amount of space they have available. Here at Bathroom Takeaway, we have a wide range of small bathroom suites that combine style and practicality and offer a space-saving solution, making them ideal for a busy family home. Our space saving bathroom sets comprise of either a simple toilet and sink set, combined shower bath, wall hung toilet or a combination toilet and basin unit, providing you with an ideal solution without compromising the style of your bathroom. 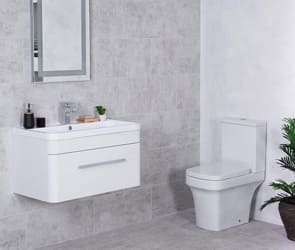 Wall hung toilets are a great solution to dealing with reduced space, as the workings of the toilet are concealed, allowing more room for bathroom furniture. Similarly, if you are trying to find a storage solution, the combined toilet and basin unit will help you save space and provide the extra space for storage.###BR######BR### Another great option for customers who are worried about space and don't necessarily require a bathtub, is our range of shower room suites. The space you save having a shower enclosure instead of a bath will allow room for other necessities, such as bathroom furniture, helping to keep your space free of clutter. Complete with glass shower screens to protect the rest of your bathroom suite, our range of shower enclosure suites are available in various sizes and styles to perfectly fit with the character of your bathroom. The shower enclosure perfectly complements the matching toilet and basin, to provide a cohesive style throughout your room.###BR######BR### For those who would like the best of both worlds, our shower bath suites are one of the most popular types of bathroom sets. They combine the luxury of bathing with the practicality of a shower, so you don't have to miss out. Expertly designed with style in mind, you are sure to find a shower bath suite to perfectly fit your needs. Perfect for a busy family bathroom, they are available in a range of sizes and as either an L or P shaped bath. The combination shower bath also comes with an easy-clean glass shower screen to protect the rest of your room.###BR######BR### If space isn't a main concern, our freestanding bathroom suites bring a touch of elegance and sophistication to your bathroom. Choose from our wide range of traditional bathroom suites, with a timeless roll-top bath, or if you prefer more angular, sleek lines, then we have a wide range of modern freestanding bathroom suites, with a perfectly matching toilet and basin.###BR######BR### With such a variety of bathroom suites to choose from, we are sure that you will find the perfect solution online at Bathroom Takeaway.###BR######BR### ###H3###Modern bathroom suites###/H3### Our range of modern bathroom suites are extremely popular at bathroom takeaway. 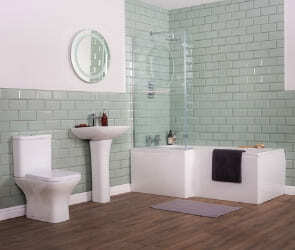 The contemporary bathroom suite range consists of some of our best-selling sets, including the Ancona and Aquila range. Available as either a freestanding bath suite, a shower suite package or a P or L shaped shower bath set, these modern bathroom suites comprise of soft edges to create the perfectly contemporary bathroom suite solution. 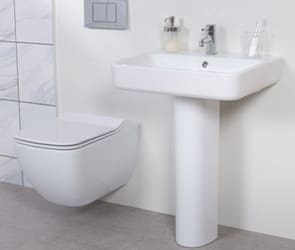 If you are looking to modernise your cloakroom, the Ancona range is also available as a space-saving cloakroom suite.###BR######BR### ###H3###Accessories for your Bathroom Suite###/H3### As well as offering a wide range of bathroom suites, we also sell complementary products that will really finish off the style of your bathroom, to providing a full design solution. Whether you are looking for matching taps, bathroom cabinets or a heating solution, we offer ranges to match your bathroom set perfectly. Our range of bathroom taps extends to pillar, waterfall and single lever taps and feature a stylish chrome finish. Whilst our bathroom cabinets come in a range of styles, to match both traditional or modern bathroom suites. If you are looking for a heating solution, you will find a range of towel rails and radiators online.###BR######BR######H3###High Quality Guarantee###/H3### Our bathroom suites are expertly constructed using the highest quality materials. As one of the most widely used materials in bathroom manufacturing, acrylic is hard-wearing and highly durable, so your bathroom set will last for years to come. We are so confident in the quality of our products, that we offer a standard 10 year "Fit and Forget" guarantee across all of our bathroom suites, so you know you are protected. 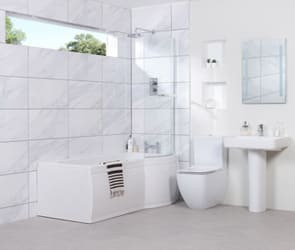 Couple this with our promise of everyday low prices instead of seasonal sales and free delivery on products when you spend over £349, you are sure to be able to find the perfect bathroom suite, without breaking the bank.